Thought to be under consideration are: Ohio Sen. Rob Portman, former Minnesota Gov. Tim Pawlenty, Wisconsin Rep. Paul Ryan and Florida Sen. Marco Rubio, among others. BATON ROUGE, La. — Republican presidential candidate Mitt Romney could name his running mate by the end of the week, a top adviser said today. The announcement, if it happens according to the adviser’s timetable, would come several weeks before presidential candidates traditionally reveal their picks for the second slot on the ticket. It would also come as Romney’s campaign seeks to deflect intensifying criticism from President Barack Obama, other Democrats and some Republicans over Romney’s business record and refusal to release years of personal income tax filings. Outside a Louisiana fundraiser today, senior adviser Eric Fehrnstrom said Romney hadn’t finalized his decision but that an announcement could come within days. Romney traveled to Louisiana to attend a private fundraiser alongside Louisiana Gov. Bobby Jindal, who is among those on Romney’s short list for vice president. 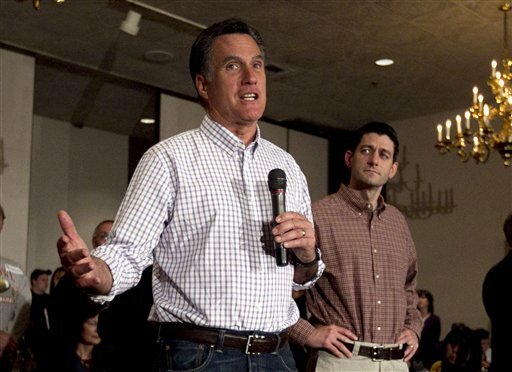 Romney raised an estimated $2 million at the event, where 40 donors paid $50,000 to attend. Fehrnstrom said Romney and Jindal met privately earlier today but did not discuss the vice presidential selection process. Jindal has been campaigning aggressively for Romney in recent weeks, as have others thought to be under consideration. They include Ohio Sen. Rob Portman, former Minnesota Gov. Tim Pawlenty, Wisconsin Rep. Paul Ryan and Florida Sen. Marco Rubio, among others. Romney did not address speculation about his running mate, but praised Jindal’s work in Louisiana. “What I have seen watching this governor in the short years he’s been here has really opened my eyes and people across the country to see what one person can do,” Romney said of Jindal. Choosing a running mate is perhaps the most important decision Romney will make before the Nov. 6 general election, now less than four months away. In the 2008 presidential race, Sen. John McCain’s selection of Alaska Gov. Sarah Palin helped define his losing bid. Romney has emphasized experience as the most important attribute in a running mate. Careful and risk averse, he’s expected to make a relatively safe pick that won’t shake up the race or overshadow his candidacy.